I have read that early Christian worship was influenced by the order of worship in Jewish synagogues. I agree. But aren’t you missing something Paul? What about the order of worship? No comment? In verse 26 he describes how “everyone” was involved, which I find very helpful. Worship should not be a spectator experience where only a few paid professionals do the work. The smaller the group, the more easy it would be, I suppose, for everyone to be involved. But what if a church has 100 people in the audience? What if they have 10,000? What are some ways that we can have worship services that are more participatory? Do we have to stop having large group worship services? How do we help strengthen the church if we just sit there during worship? Is giving and singing enough? 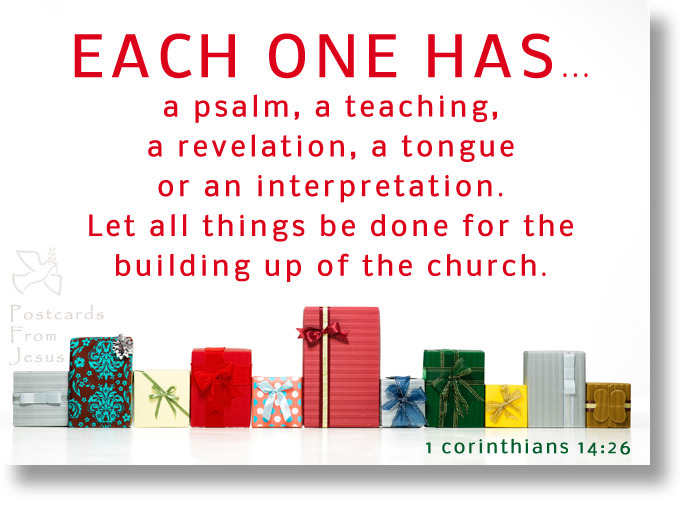 What about the sharing of tongues and prophecy and revelation that Paul mentions? Have we cut them off? And if so, is it wrong? To consider the possibility that it might be wrong, consider Paul’s closing comment in verse 39: “Therefore, my brothers, be eager to prophesy, and do not forbid speaking in tongues.” Should only the pastors be eager to prophesy? Paul certainly didn’t limit prophesy to the paid professionals. I for one am glad that Paul or any other apostle didn’t give us a specific order of worship that we had to follow. Maybe it would make things easier if he did. I have the sense that it is much, much better for us to implement principles as we see fit. As the comment discussion bore out in last week’s intro post, it seems to me that different churches with varying approaches to worship can be a very healthy expression of God’s Kingdom. We are unique people with so many kinds of personalities. We love to express ourselves in many ways. And it is okay if we are different. Thus is it okay if some churches are more intellectual in their worship, if some are more emotional, if some have the same order every week, if some mix it up. A few months ago I was talking to a visitor to Faith Church, and he asked what kind of worship service we have. Was it traditional, was it contemporary? I said “We call it experimental.” He got a really strange look on his face. At Faith Church we like to change things up from time to time. We stopped printing an order of worship a long time ago because we wanted people to stop focusing on words on a page, and instead to focus on worshipping God that morning. We know that people can still worship God by looking at a printed order of worship in a bulletin, but we made the change anyway as a small way to symbolize the attitude that we believe is central to experimental worship: humility. At the heart of experimental worship is a belief that we do not have worship figured out. Instead we see ourselves as learners. We look to many traditions, many sources for teaching about how to worship God. By containing ourselves to only one style of worship, to only one order of worship, we felt that we were potentially missing out on learning a wider richness to the concept of worship. That’s why we’ve had Church Has Left The Building Sundays, Silent Sundays, Artistic Sundays, Worship in the Park, and more. 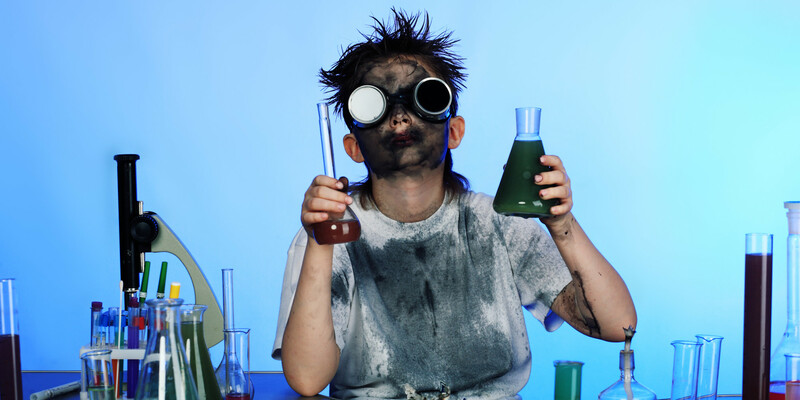 We know that experimenting can run the risk of coming off as gimmicky. We’re okay with that. Our heart is anything but trying out something for kicks and giggles. Instead, we are passionate about learning more and more how to worship God. We committed to doing things in a fitting and orderly way. We know we have much to learn and we’re eager to experiment more so that we can learn more! Sure, on most Sundays, if you worship with us at Faith Church, things will feel pretty much the same week to week. But as you look back over the course of a year, you’ll see that we have experienced worship in a variety of ways. We’re still looking to experiment! So if you have suggestions for us, please comment below. Do we need an order of worship? Raised in a Conservative Baptist church that practiced a style of worship very much influenced by the frontier free worship tradition, I will never forget two of my first experiences with liturgical style. The first was at a mainline Presbyterian Church in New Jersey where my mother’s sister and her family attended. After quite a few series of standing and sitting for unison prayers and creeds, all of which I was very unfamiliar with, I said “This is crazy!” a bit too loudly and received a stern look from my parents. About six years later, now a college student and bit more mellow, I attended a cousin’s wedding in an Episcopal Church. One feature of the ceremony was communion, first for the couple and then for anyone else who wished to participate. My dad decided that our family would not participate. I remember feeling quite relieved as this church’s sights, smells and sounds were very foreign to me, and thus uncomfortable. I didn’t want to have to experience its venture into the sense of taste as well. What if it was…(gasp)…wine! But I suspect my dad had us abstain due to theological reasons, feeling we shouldn’t align ourselves with the Episcopal Church. As I reflect on these two occurrences and many subsequent forays into different Christian liturgies, it is clear that the corner of the world of worship that I grew up is just that, only a corner, a small expression of a much larger body. It is interesting how quickly we can assume that our particular expression of worship is the only one, or at least the only right one. Still more interesting is that God never inspired a biblical writer to direct us into one particular liturgy. In that we see his genius, allowing worship that can change from one time to the next, and from one culture to another. At times I wish I could see exactly how the earliest Christians worshiped, or perhaps discuss my church’s particular liturgy with Paul or Peter. Do we have it right? What could we change? Would we even like what they did? Does your church have an order of worship? Is the order of worship printed in a bulletin or program so people can follow along? Does the order change much week to week? Does it matter? Should a church allow space in a worship gathering for the people to choice on the spur of the moment how they want to express themselves in worship? Or should everything be planned in advance, following an order? Frank Viola in his book Pagan Christianity, which I have currently loaned out or I would be able to quote directly, talks about the history of the order of worship as having been born from pagan gatherings. Viola points to a few lines of Scripture that seem to teach a much more open, participatory style of worship. Those verses are the next section of 1st Corinthians, 14:26-40. The first few lines are compelling: “When you come together, everyone has a hymn, or word of instruction, a revelation, a tongue or an interpretation.” Does that mean no one was leading the service, that there was no order of worship that they followed? Viola thinks so. He suggests that worship gatherings are actually damaging to discipleship when most of the people sit passively while a couple paid professionals do all the work. But if we don’t have an order of worship, won’t our worship services get out of control? They sure did in Corinth. Can we possibly open the worship service to let everyone be involved? What if someone talks too long? What if they say something crazy? What if the same people monopolize the time every week? What if they are obnoxious? What if they teach something that isn’t true? Isn’t it really better to have an order of worship that is led by a few people while the rest join in by singing a couple pre-selected songs, giving, and following along with the rest? What is the purpose of worship? To give everyone a chance to get involved? Join us Sunday at Faith Church as we talk about this further!